It all started because of Monkey Bread. For almost 2 years, while attending Columbia University, I lived on 125th Street and Broadway. Around the corner from where I was staying was a small and humble bakery called The Bread Shop. (Sadly, I’ve learned through a quick google search that The Bread Shop has closed down — another victim of the gentrification of Morningside Heights and Harlem that’s raised rents and forced out dozens of great “mom & pop” shops.) It was a real neighborhood hangout, a place where local residents and students would stop in for a fantastic baked yummy or idle away an hour over coffee and cake. The two biggest reasons that I went to The Bread Shop were the delicious and cheap Indian vegetarian lunches they served every Tuesday and Thursday and their Monkey Bread, baked fresh daily. Before The Bread Shop, I had never eaten Monkey Bread before, let alone heard of it. There, it was a deliciously sticky “pull apart” bun, smothered in a white icing and flavored with sugar and cinnamon. It was, over those 2 years, one of my favorite sweet carb-laden treats. Last week, I told my wife S that I wanted to try making Monkey Bread. Eyebrows raised, she looked at me skeptically and then remarked that the only Monkey Bread she’d heard of was savory. Maybe I had gotten the name wrong, she gently suggested. She even showed me a recipe for an herbed and savory version in the King Arthur Flour Baker’s Companion. Determined to find a recipe, I tore through several books in S’s baking and dessert cookbook collection (some 2 dozen volumes). None of the ones I looked in had anything called Monkey Bread listed. I epicurioused it and came up empty. I googled it and this time I found several recipes on cooks.com, but none of them sounded appealing. Most of them called for pre-mixed (canned) biscuit dough. At S’s suggestion, I decided instead to try making Sticky Buns, which seemed like a good idea until I started reading the recipe she recommended I follow — Pecan Sticky Buns from Baking with Julia by Julia Child and Dorie Greenspan. To make these buns, which sounded divine, I would have to make brioche dough for the very first time. Yikes! 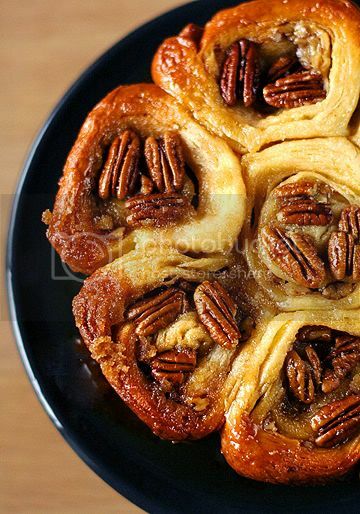 The filling for the buns was a combination of sugar (1/4 cup), cinnamon (1/4 teaspoon), and pecans (1 cup, chopped). The dough is divided into two portions. Each one is rolled out to around 11 inches by 13 inches and a quarter inch thick. An egg wash is applied to the lower 3/4 of the dough and the filling sprinkled over it. It’s then rolled up into a log, starting at the lower end, wrapped in plastic and frozen for 1 hour. While the logs were chilling in the freezer, I prepared my pans; the recipe calls for two 9 inch round cake pans with high sides. Spread 4 ounces of softened butter on the base of each pan. Then sprinkle 1/2 cup of brown sugar over each pan. Once the logs are hard, slice each one into 7 pieces, each approximately 1.5 inches wide. Lay the slices flat side down and press 3 pecan halves into the top of each. Then place them, pecan sides down, into the prepared pans. Place 6 of them in a circle, with the 7th slice in the middle. Let these stand uncovered for 1.5 to 2 hours. The buns will rise and grow to touch each other. Pop them into an oven preheated to 350ºF/180ºC for 35 to 40 minutes, or until golden brown. When done, quickly invert them onto a serving dish, let cool for a few minutes, then serve. Given that I’d never made these before, I have to say that despite her making considerable fun of me, S was impressed. My neurosis over making the brioche dough had me yelling for her advice throughout the whole process, but pretty much I had managed to make these on my own. A considerable feat for a very undomestic husband. The only problem is that now S expects me to be able to make brioche for her whenever she wants. Wow, i want a piece of this monkey bread right now. It looks so yummy. Congrats for your first brioche dough; can i place an order for the next one you’ll make? Looks wonderful-I had a similar experience when trying to make danishes. Basically, I had no idea what I was doing, but the end result was more than adequately edible! Re: monkey bread, http://www.recipezaar.com has tons of recipes for monkey bread. Most seem to use refrigerated cans of buttermilk biscuit dough (some crescent dough). Perhaps if you followed one of those recipes, but make your own biscuit dough, you could find what you’re looking for. I might even try. Yum. I’ve never had monkey bread, but I’ve wanted to try it every since I heard about it! Why isn’t it a staple of all bakeries. Doooh. 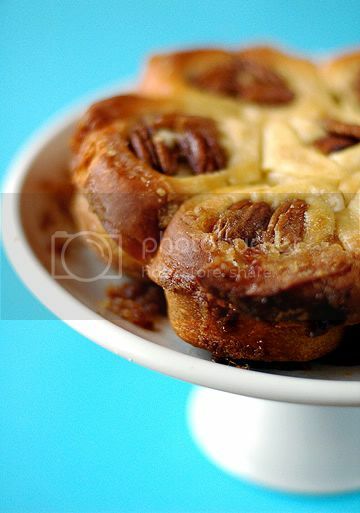 Arrgh those sticky buns are byoootifyul…okay, I need baked goods right now. For a first timer, this looks so good that you deserve a medal. Well done for persevering and sticking [sorry for the pun] to it til the end. What a success! Looks so yummy! I wish i lived in Singapore then i’ll be as lucky as J to receive such a treat. oh these look so good. no matter what name i would attack these in a heart beat! i love your recount of the making brioche for the first time. i too thought i was doing it all wrong. unfortunately i am one of those people who cannot read a recipe right through when i want start cooking asap or more importantly eat asap. i might give these a go soon… they look so delicious! From our kitchen: I’d love your recipe. Please email it to me. Thanks! J: My pleasure. Ah, we have that book also. Can’t believe I didn’t look at it the first time around. Thanks. Fanny: Hah hah… considering how hard it was to make, you might be waiting a long time for that order. Marilyn: Yeah, that might work. I was really turned off by the idea of using premade, frozen dough. Robyn: I agree. More bakeries should make Monket Bread. Mae: Thanks. I guess I’m just lucky S chose the right recipe for me to test and that she was around whenever I freaked out. Deborah: Thanks. They were good too. For my tastes though, I think I’d add even more sugar into the filling — I like things sweet. The sticky buns look wonderful, well done for a first time beginner! Now of course you have made me desperately hungry for some cinnamony, sugary, icing covered monkey bread. Cook’s Country, the offshoot of Cook’s Illustrated, recently had a from-scratch version of monkey bread as well. Butter and flour a 1 quart or larger ring mold or tube pan and set aside. Whisk the yeast with the milk in a large bowl. Whisk in 2 of the eggs and then the sugar, salt and 4 cups of the flour, switching to a spoon when the dough gets stiff. Stir in the softened butter and knead the dough in the bowl until it comes together in a ball. turn out onto the work area and knead until it forms an elastic ball, sprinkling with and working in up to 1 cup more flour to keep dough from getting sticky. Place dough in a clan bowl and cover with plastic wrap. Let rise in a warm place until doubled in size, 1 to 2 hours. Punch down dough and turn out onto a lightly floured work area. Roll dough into a log and cut into 28 equal size pieces. Shape each piece into a ball, dip in melted butter and place in the prepared pan, staggering pieces in 2 layers. Cover loosely with plastic wrap and let rise in a warm place until doubled in bulk, about 30 minutes. Preheat oven to 375°F. Beat the remaining egg and lightly brush over the top of the bread. Bake until top is nicely browned and dough is cooked through, 25 to 30 minutes. (Test by turning out the loat onto a rack; the bottom and sides should be nicely browned.) Turn upright on another rack to cool slightly before serving. Those look delicious! I’ve often thought sticky buns seem too rich. But yours look both crunchy and soft and very tasty, I’d love to try one! By the way, have you seen the online video of this recipe (I assume it’s similar, although here Julia is hosting Nancy Silverton) on the PBS website? It’s very detailed (broken down in different parts, first the brioche dough, etc.) The website is here http://www.pbs.org/juliachild/video.html, and you can find the recipe by looking up Nancy Silverton. This web-site offers a large variety of videos, with the transcripts so you can jump to the interest bits. Those look really yummy. I use Rose Levy Beranbaum’s The Bread Bible for my Brioche dough. It’s utterly foolproof. And her chocolate sticky buns are glorious!! Stef: I’m not a member of Cook’s Illustrated. Any chance you could email me the recipe? Luisa: Thanks so much. The recipe looks great. Astrid: Hi, the recipe I used is the one by Nancy Silverton. The book is a collection of Julia’s recipes and recipes by guest chefs that appeared on her TV show. I didn’t know that the videos were available online. Thanks so much for pointing me to them. Missy-J: Thanks. I’ll take a look at that recipe as well. Chocolate sticky buns sound great. i love beginner stories because it makes me that much more tempted to try them myself. they look wonderful! Probably I’ll substitue the pecan with raisins. Don’t think i can get them here. Beautiful. I´m longing to have some highly sticky confectionery now, but in view of the enormous dinner I ate yesterday, I´ll just drool over the picture. looks like oranatang bread :-p looks very sweet. Oh I can’t stop drooling 🙂 I can eat this every day, it looks so yummy – and again, absolutely beautiful pictures! I made these tonight. Yum! I’ve never had it before but it looks yummy. I was going to ask you if you wanted my recipe for monkey bread, which is the one Luisa so kindly posted. I’ve done it many times and tried many other recipes, but that one is the best. Good job on those sticky buns. I was going to comment that they look eerily similar to the one in the Baking With Julia book. No wonder. Btw, here’s my post on monkey bread. Hijackqueen: Good idea, although I’m much more of a pecan person. Gustad: Saw the hotdog pix. Scary! Prisca: Cook, I’ll try them. Thanks so much for the heads-up. Keiko: Coming from the queen of blogbaking, I’m very flattered. Danielle: Awesome. Glad they worked. Lori: Thanks. The recipe looks great. I can’t wait to try it. You might want to check your oven as the center looks uncooked while the edges look crispy brown. Every oven has its quirks so nothing is so handy as a thermometer and and adjustable rack. Yes, no two ovens ever seem to perform in quite the same way. Rest assured that we have a bunch of well-used thermometers. Especially since our oven tends to get too hot in the corners. The unbrowned centre irked me too, but it was completely cooked. What was missing was a little more crispness and a dose of aesthetic pleasure. The visible part of the buns were browning perfectly evenly. What you see in the picture is the bit which was sitting on the base of the pan, which is meant to be the actual top as per the recipe’s instructions. We had no way of seeing how underdone or browned it was until we unmolded it from the pan. Have you tried this recipe before? Did yours turn out evenly browned? I might try placing the pan on a baking stone to even out the heat next time. Indeed! I’m so glad you came to visit Pie in the Sky and liked my monkey bread recipe. I made a second loaf where I made the dough myself, and it was great…I also ground my own cinnamon, and that really made a big difference. (Actually, the cinnamon sticks – not cassia – were from a trip to ecuador, and i was keeping all my ecuadoring spices in a ziploc bag together, so the cinnamon came out tasting a little like anise…which was a good thing! )Anyway, I’m an avid reader of Chubby Hubby, so I’m glad that we’re friends now =) Enjoy your monkey bread!